Some time ago now we began a new series of posts on Inspirational Leaders. The idea behind these posts is to profile those people who have contributed to making the world a better place, but who have also inspired others to do so. In particular we are featuring some of the lesser known inspirational leaders that many of us have never heard of before. Ela Bhatt is the first person to be profiled in our new series. We hope you enjoy – and feel inspired! My first introduction to Ela Bhatt was through Gloria Steinem. In her book, Revolution From Within, Gloria Steinem she tells a story about a young Gandhian labour organiser who worked with the poorest of the poor women in India. What resulted was one of the earliest examples of microfinance. But also something else happened to this group of women. The way that they felt about themselves and what they might be able to create changed. I was so moved by this story that I would regularly tell it to my Social Work students (in the days when I was lecturing) because I saw it as one of the most compelling examples of change – individually and socially. This group of women formed the Self-Employed Women’s Association, SEWA in 1978 and the woman who facilitated this process was Ela Bhatt. “By the time I first met Ela and some these women in Ahmedabad in 1978, their Self-Employed Women’s Association, whose acronym SEWA also means “service,” was about six years old. They had exposed the corruption of police who demanded bribes, started childcare centres and infant creches, and even persuaded the Bank of India to let them open a special branch for their small loans and hard-won savings. They themselves pounded the streets for members, put two improvised teller windows in a small room, and literally created a bank. … To the surprise even of Ela Bhatt’s sponsors, a Gandhian textile workers’ union that had considered these women too passive and disparately employed to organise, they were doing better than many more educated workers in traditional unions. What made the difference? First, an organiser who had lived the problems of being a woman herself, and who listened to each woman as a sister. For the first time, they felt worth listening to. Second, their mutual support and their small but growing list of successes when dealing with corrupt police and dishonest employers. As a lawyer and a skilled organiser, Ela knew the importance of both listening and explaining new alternatives in using demonstrations, the media, and even the courts. But Ela Bhatt herself thought there had been one crucial turning point. After the work of forming SEWA, Ela suggested the founding group celebrate by taking a holiday together. The women and never done anything separate from their families and children before, but other workers took holidays. Why shouldn’t they? After a discussion, they decided to visit Hindu holy places that were nearby, but farther from home than most of these women had ever been. After much planning and preparation to free them from family obligations, which was not easy to do even for a few hours, Ela hired a rickety bus and they set off. Everything was fine until they neared a temple that could be reached only by boat. Menstruating women were not allowed in temples, and inevitably, some of the women had their periods. They were sure that if they crossed the river, the boat would capsize to punish them for defying tradition, and since they couldn’t swim, everyone would drown. By appealing to every emotion from curiosity to defiance, Ela finally convinced them to get in the boat and consign themselves to the wide river and fate. They crossed – and nothing happened. After placing their offerings of fruit and flowers in the temple, they crossed back again – and still nothing happened. For the first time in their lives, they had defied the rules that denigrated them – and they had won. Importantly this story says a great deal about the connection between self-esteem and our capacity to take charge of our lives and create the changes that we need and want. This is an important theme for me and I believe that it holds great potential in terms of deepening our understanding about how broader and more sustainable social change might occur. Today SEWA remains a powerful force for organising and protecting women’s work in India. In 1984 they began to offer health insurance for members and this has become one of their most effective programs. 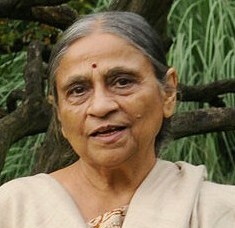 Ela Bhatt remained involved in SEWA, serving as the General Secretary until 1996. Since 2007 she has been a prominent member of The Elders and is particularly involved in the struggle for equality for women and girls, and most importantly, ending child marriage. I feel very grateful to have been influenced by an amazing woman such as Ela Bhatt so early in my professional career. I have held that story close to me for many years and it has informed many of my beliefs about how change might occur. In a world where visionary and inspirational leaders seem to be few and far between, Ela Bhatt stands out as both an activist and a leader whose commitment to making the world a better place is undeniable and whose influence for many, has been life changing.